How do I know if a low-cost test is reliable? Here, you will find out everything you need to know about the VeriQuick product, including how its sensitivity and accuracy may affect your results. If you've already decided you want to try the VeriQuick Pregnancy Test, buy it now at Amazon. Pregnancy test sensitivity affects how early you can expect to achieve an accurate positive result. Even the most expensive "early result" test measures the amount of Human Chorionic Gonadotropin (hCG) pregnancy hormone in your system. After conception, the level of hCG is low. One week after implantation, you begin to have increased hCG. For the most part, if you are pregnant, you can expect to have a 25 mIU/ml hCG level in your urine ten days past ovulation (dpo). By the time you are two weeks pregnant, you can expect to have a 50 mIU/ml level of hCG. In essence, the difference between using a home pregnancy test with a 25 mIU sensitivity and one that has a 50 mIU sensitivity is four days. What is the mIU sensitivity of VeriQuick Pregnancy Test? Your VeriQuick Pregnancy Test can report a "big fat positive" (BFP) when the level of hCG in your urine reaches 25 mIU/ml. WAIT!! What about VeriQuick Pregnancy Test Accuracy? Fluctuations of hCG among "normal" women and the limitations of hCG-based tests mean that you cannot expect to have an accurate test result until the day of your missed period. Go ahead! Read the fine print! Even the early result tests have a disclaimer when they boast of a 99-percent accuracy rate. You need to know that over-the-counter pregnancy tests are 99 percent accurate from the first day of your missed period. Although the manufacturer of the EPT does not make the VeriQuick test, you will discover that you get similar results. Like the EPT pregnancy test, VeriQuick has a 99-percent accuracy rating from the day of your expected period. Of course, individual hormone levels may vary. In other words, you might get results earlier or later than the first day of your period. Also, you can test early using this in-home-pregnancy test, but doing so will compromise the test's accuracy. Reportedly, VeriQuick Pregnancy Test sensitivity is 25 mIU/ml. Therefore, it is one of the most sensitive retail home pregnancy tests on the market. For your reference, we've posted the VeriQuick Pregnancy Test instructions here at CPG Health. Packaging and product specs can change, so make sure that you always read the instructions that come with the test item that you use. Negative - A control line (C) present and test line (T) absent. You are not pregnant. Positive - A control line (C) present and a test line (T) present. You are pregnant. Invalid - Neither a control line (C) nor a test line (T) is present. The test result is invalid. Disregard it. Invalid - A control line (C) absent and a test line (T) present. The test result is invalid. Disregard it. 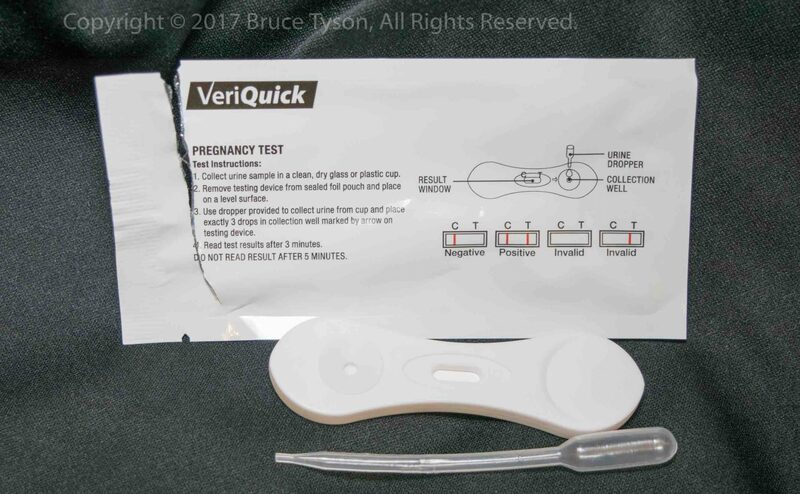 VeriQuick Pregnancy Test faint positive, what does that mean? If you have a VeriQuick Pregnancy Test faint positive, consider it as a positive test result. If you are uncertain of your test results or have tested before the day of your expected period, you should re-test later to confirm your result. What are VeriQuick Pregnancy Test evap lines? When your urine evaporates from the VeriQuick test, it can leave a residue that might at first appear to be a positive test result. Carefully examine your test to make sure that you have a valid result. Based on our information and that of our readers and subscribers, VeriQuick Pregnancy Test evap lines are not a common problem. I got a VeriQuick Pregnancy Test negative. Now what? You tested too early (VeriQuick Pregnancy Test before missed period). Every day before your missed period makes your results less accurate. This is the case for all home pregnancy tests, including those that specifically state that you can test early. Read all disclaimers in fine print on a pregnancy test package to understand the claims made in large print. You have a lower-than-normal level of the hCG pregnancy hormone. You waited too long (more than 5 minutes) to read your result. You read your result too soon (sooner than 3 minutes). You didn't place 3 drops of urine in the collection well. You placed 3 drops of urine in the results window, not in the collection well. Other miscellaneous factors can cause you to receive either a false positive or false negative result with your VeriQuick Pregnancy Test. You have already seen the instructions that are printed on the outside of the VeriQuick box. Inside the box, however, you will find different VeriQuick Pregnancy Test directions and other product information. The One Step hCG Urine Test is a rapid pregnancy test, which you can easily carry out yourself. It detects the presence of Human Chorionic Gonadotropin (hCG), which appears in urine during early pregnancy. How does the VeriQuick test work? hCG is a hormone produced by the developing placenta shortly after conception and secreted into the urine. This pregnancy test contains antibodies which specifically react with the hormone to create an easy-to-read line indicating whether or not a person is pregnant. A sealed pouch that contains the test device and dropper. Desiccant that helps preserve the test during storage. Discard this after opening the package. The concentration of hCG may vary with each individual, therefore positive results may show within 3 minutes of testing. Disregard any result read after five minutes. What else is needed to use the VeriQuick home pregnancy test? You will need a clean, dry plastic or glass container to collect your urine sample. Also, you will need either a timer or watch. Your test results are time sensitive. The following guidelines will ensure that you properly complete the VeriQuick Pregnancy Test. A urine specimen at any time is appropriate for pregnancy testing, but the first-morning urine specimen is optimal because of its highest concentration of hCG. This can facilitate the testing process. Collect urine in a clean, dry glass or plastic cup as close to testing time as possible. Remove the testing device and dropper from the foil pouch that came inside your pregnancy test box. Place the test cassette on a level surface. Holding the sample dropper vertically, add exactly three drops from the urine specimen to the sample collection well on the cassette. How do I read VeriQuick test results? Read results from your VeriQuick Pregnancy Test by looking at the results window. The "C" represents "control." A line should appear at the "C" to confirm that you have a valid result. The "T" represents "test." A line or absence thereof here will tell you whether you are pregnant, as long as there is a line under the "C."
Negative test result: One colored line appears in the "C" region, but no line appears in the "T" region of the test window. Positive (pregnant): A distinct colored line appears in both the "C" and "T" regions of the results window. Invalid: Either no line appears in the "C" region or a line appears in the "T" region, but not in the "C" region. If you receive a VeriQuick Pregnancy Test faint positive, repeat the test in 48 hours to confirm your pregnancy. I see my VeriQuick Pregnancy Test results. Now what? If you have a positive pregnancy test result (two lines), visit your doctor. He or she will confirm that you are pregnant and create a treatment plan. At the doctor, you might find out that you have a VeriQuick Pregnancy Test false positive. Ask all your questions to your doctor. Unless you have a VeriQuick Pregnancy Test false negative, you are not pregnant if you have a "control" line displayed on your test. If you have no menstrual bleeding or have other reason to believe that your period should've started, visit your doctor to discuss your situation. Also, read the following section on "Limitations." What are the VeriQuick Pregnancy Test limitations? As it is with any diagnostic procedure or self-testing kit, confirmation of pregnancy should only be made by a physician after evaluating all clinical and laboratory findings. If a urine sample is too diluted, it may not contain a representative level of hCG. If pregnancy is still suspected, another urine sample should be collected and tested 48 hours later. Low concentrations of hCG very early during pregnancy can give a negative result. In this case, another urine sample should be collected and tested in 48 hours after completing your first test. Elevated levels of hCG can be caused by a few conditions other than pregnancy. Therefore, the presence of hCG in the urine specimen should not be used to determine pregnancy unless such conditions have been ruled out. Consult your physician for more information. A normal pregnancy cannot be distinguished from an ectopic pregnancy based only on hCG levels. Spontaneous miscarriage may cause confusion in interpreting test results. Consult your physician for more information. Sterility treatments may cause false results. Discuss this matter with your doctor. Negative results are expected in healthy, non-pregnant women. Although hCG levels in normal pregnant women vary, this test is capable of detecting pregnancy on the day of your missed period. You need answers? We've got 'em! There is a difference in color between the Control (C) line of two different tests. Does this indicate a problem? No. Variations in the color of the Control (C) line will not affect your test results. Can results be interpreted after five minutes? No. Test results must be read within five minutes after beginning the test. A negative result (no line in the "T" (Test) region) can change to a positive result within a few minutes after the 5-minute test period ends. A positive result after five minutes, therefore, does not indicate pregnancy. Read results within five minutes of taking the test and immediately discard test unit to avoid confusion. A pink background color and vertical streaking appeared in the result window during the test. Is this a concern? No. Each urine sample will vary in its chemical makeup, as will the humidity in the testing environment. Such variations in physical and chemical conditions can cause vertical streaking, and/or the pink background color, but will not affect the test results. As long as the Control line (C) appears within the five-minute test period, the test is working properly. The Very Quick Pregnancy Test is for in vitro diagnostic use and is for external use only. CAUTION: Keep out of reach of children. This kit is for external use only. Do not swallow. Securely discard after first use. The test strip and dropper cannot be used more than one (1) time. Do not test beyond the expiration date printed on the bottom of the carton and on the foil pouch. Do not use this test kit if the foil pouch is punctured when you first open the box. Do not use this test kit if the foil pouch is punctured, torn or open in any way (other than you opening it for initial use). Store test at 40℉ to 85℉ in the sealed pouch. Keep away from direct sunlight, excessive moisture, and heat. Do not freeze the test device. To avoid exposure and contamination to the test device, open the foil pouch as close to testing time as possible.